We saw a somewhat rough E9 BMW last fall, and now we're going to look at one that's a bit nicer. I've seen this '74 3.0 CS moving around under its own power pretty regularly, while the '73 3.0 CSi seems to be more a work in progress. The 2002s seem to get a lot more love than the big 6-cylinder cars of this era, but we'll see who fares best in the poll after the jump. Looking at the past BMWs in this series, I'm realizing that I ought to go photograph one of the late-70s/early-80s 5- and 7-series cars I see around town. They're DOTS-worthy, yes? This car lives quite close to the 1972 Fury, which can be seen in the background of this photo. Same era, totally different philosophy. The price tags on the two cars differed quite markedly as well. 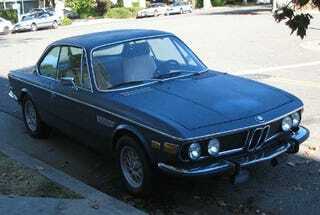 The '74 3.0 CSi coupe sold for $10,634, while the '72 Fury III 4-door hardtop listed at $3,813. You got a 150-horse 318 V8 standard in the Plymouth, while the BMW cranked out 170 horses from its 3-liter six (of course, an extra 85 bucks would get the 185-horsepower 400 in the Fury). I know, apples and oranges. All right, time for the poll! Which Bavarian machine do you like best?